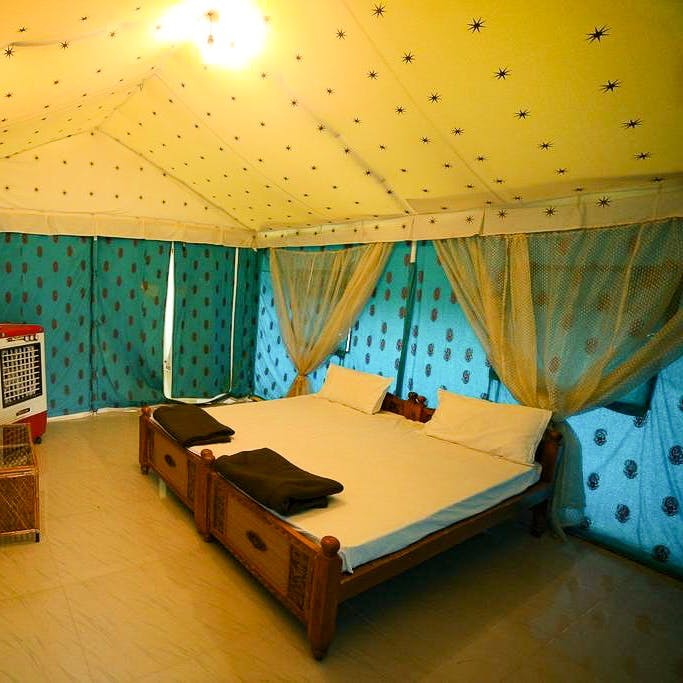 The Wild Cabana is a lesser-known adventure resort in Turkapally, which is around 40km away from Hyderabad. If camping under the stars or conversations over barbecue and bonfire sound are just what you need, drag your squad here. With an outdoor pool and walking trails, this resort offers more than what appears on the surface — camping, pretty tent stays that come with comfy beds, and a seating area. Equipped with activities like a playground, board games, ropeways, cycling tracks, their mandatory evening entertainment will keep you hooked. It's wise to travel here in a group as you can set up your own BBQ grill (at an extra charge) by the patio or private pool, or ask for a movie night, which is arranged at a minimal charge. We're loving the common dining area (both indoors and outdoors) where you can interact with other travellers. Plus, the restaurant and the mini-bar keep you occupied. Brownie points for the patio that comes with every room, and they serve scrumptious English breakfast at INR 150 only. While the gardens and lawns are perfect for you to unwind, don't go expecting a luxurious stay because this eco-friendly resort is mostly designed for sustainable travellers. If you're looking for hosting parties at an offbeat place, this one has you covered. But we'd recommend this for a weekend getaway where you can score some views and indulge in a night of movies and barbecue. Although the rooms are equipped with air-conditioning, you can avail them on an additional charge only. Budget male travelers can check into the dormitory room that costs around INR 10,000 for eight beds. This is perfect only if you are traveling in a group as you cannot pay per bed.